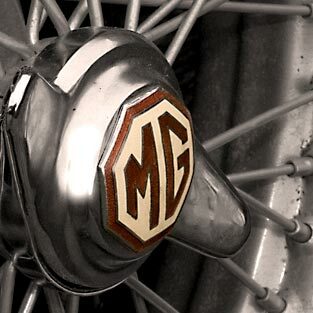 In the 1920’s and 30’s, MG were the car manufacturer the everyday enthusiast could afford to aspire. They won races, broke speed records and and defined the term ‘popular sports car’ on both sides of the Atlantic. In 1922, Cecil Kimber was sales manager of Morris Garages in Longwell Street, Oxford. Morris cars were extremely popular, making nearly half of all Britain’s cars, but also rather ‘sensible’. Nothing in their range to really set a motoring enthusiasts pulse racing. Kimber was one such motoring enthusiast and also a talented artist. He designed and started making mildly re-bodied Morris’, these cars became known as MG’s, taking the initials of Morris Garages. The 18/80 of 1928 is considered the first ‘proper’ MG. This car finally distanced itself from its Morris underpinnings with a distinctive new grille design (also the work of Kimber) and the MG car company had been registered as a separate entity earlier that year. While the launch of the original Morris Minor, also in 1928, gave M.G. a platform to flourish, allowing them to develop the first in a long line of, soon to be, legendary Midgets. The Midget line started with the M-Type in 1929. The Minor’s 847cc, overhead cam, in-line 4-cylinder, matched with light 2-seater fabric over a wooden frame bodywork (although later cars had metal bodywork), endowed the little car with a top speed of 65mph. The press loved it and at a price of just £185, tantalisingly within grasp of the mass market, the public did too. During the early 1930s MG also made headlines through motor racing. MG’s finished first and second in class in the 1933 Mille Miglia, also picking up the team prize. Then there were victories in three successive Tourist Trophy races, one at the hands of the great Tazio Nuvolari. A series of EX (experimental) MG’s took on and broke land speed records. In turn, this winning technology, made it back onto production MG’s in the showroom. Production halted during the second world war but after the war ended in 1945, with no home-grown sports cars of their own, American ex-servicemen took their MG T-series sports cars home. This created a taste in America for open-top sports cars. Hollywood superstars like Billy Wilder and Bette Davis drove MG’s, sales boomed and with 80% of MG production was exported to the USA. In time, the T-series cars were followed up (not before time some would argue) by the MGA and then the MGB (for a long time the world’s most popular sports car). With the Midget name returning in 1961 on a small sports car based on the 1958 Austin-Healey Sprite. MG today is a very different from the company started by Cecil Kimber. Despite the glories, the main battles MG seemed to face were in the boardroom. In the past 80 years the marque has found itself under the control of 8 different owners and in 2005, as MG Rover collapsed, the name and manufacturing rights of this very British of companies, were sold to the Nanjing Automobile Corporation, China’s oldest car manufacturer.